The Japanese launch of the iPhone 6 and iPhone 6 Plus was an absolute success for both Apple and the carriers offering the handsets, reports Forbes, pointing to sales rankings provided by BCN. 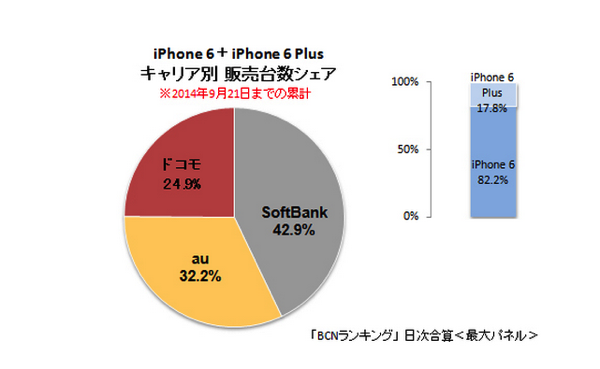 According to BCN’s survey, from September 19 through September 21, the winner was Softbank, as the carrier accounted for 42.9% of all iPhone sales in Japan, followed by KDDI with 32.2%, NTT DoCoMo with 24.9%. BCN tracks smartphones on a weekly and monthly basis, and in its latest weekly rankings the iPhone 6 took 8 of the top 10 spots with the iPhone 5s taking 5th and 8th place. The iPhone 6 Plus’ highest ranking was 11th and it has a fairly strong showing taking 5 of the next 7 spots. Apple’s success compares to the month of August where the iPhone 5s took the 3rd and 4th positions and the 5c captured the 6th, 7th and 10th positions. What the iPhone is experiencing is similar to when Apple launched the 5s last year. Of the iPhones sold during the first weekend, the regular 4.7-inch iPhone 6 turned out to be the most sought-after device, as 82.2% of the buyers opted for it, with the remaining 17.8% choosing the iPhone 6 Plus. As Forbes highlights, the 4.6 to 1 ratio is similar to what Fiksu found in the US and Europe. As Canadian buyers have experienced, Apple is severely backlogged because of demand for the iPhone 6 Plus. Furthermore, in regard to the rumoured 500,000 units that the company will reportedly receive on October 8, it is questionable whether this will even be enough to meet demand.